Communicate the relevance of this area in everyday life. This particular ‘Science Magic Show’ has been developed to focus on the science curriculum for children between the ages of 6 -12 year old and to encourage them to continue further studies in science and to take an interest in the amazing world they live. The Science Magic show can be presented at schools, libraries, science centres, museums, universities shopping centres and community events. The show is funny, interactive, educational, inspiring and importantly…entertaining! Kids learn best when they are having fun. Australia’s National Science Week, established in 1997, is an annual celebration of everything science, with events held at various locations throughout Brisbane and the rest of Australia. This is what I learnt from watching the childrens TV show Sesame Street, which has won more awards than any other children’s show, in fact 159 Emmy awards and 8 Grammy awards. You may recall The Cookie Monster, Grover, Big Bird and friends and how they cleverly used humour to improve fact and knowledge retention in young children and appropriate comedy to increase engagement and inspire children to seek further information. This is because researchers have concluded that age appropriate and topic related humour have real benefits that help children learn. I have built my science magic show around this philosophy, which has been so successful. Using a strong visual style and fast-paced magic tricks as a tool to teach science allows me to implement ‘well thought out’ and relevant contextual humour that creates a fun learning environment and increases the engagement with children which leads to better learning outcomes. 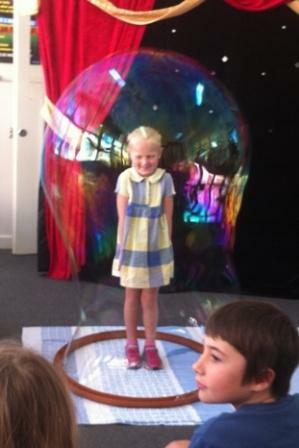 You can’t beat the combination of magic and science for a fun learning environment for children. Of course National Science Week is not just for children, it is for all ages and all people throughout Australia. National science week runs annually during August, although many activities take place during the entire month of August. Approximately one thousand science related events happen across Australia every year and it is estimated to reach over one million people.